This is an ex-library book and may have the usual library/used-book markings inside. This book has soft covers. In fair condition, suitable as a study copy. Good. 1401323251 RIP TO DJ. Very Good. The Last Lecture (Thorndike Nonfiction) by Zaslow, Jeffrey. Glued binding. Paper over boards. 285 p. Contains: Illustrations, black & white. Thorndike Nonfiction. Very Good. 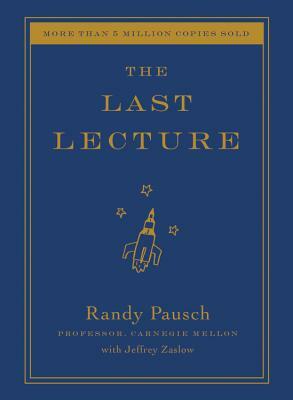 The Last Lecture by Pausch, Randy, 2008-04-08. Glued binding. Paper over boards. With dust jacket. 206 p. Contains: Illustrations, black & white. The story of how Randy Pausch responded when he learned that his invitation to deliver a 'traditional' "Last Lecture" to a group of college students turned out to be his actual last lecture after he was diagnosed with cancer of the pancreas. This is a book for a limited readership, I'm thinking. Had difficulty getting into it, but that is a subjective viewpoint. It is well written, and I would recommend it to a few of my friends who, like me, enjoy this genre of literature. Bought as gift, and it was given high marks by the recipient as a wonderful, interesting read. This is a good but sad read of a man, a father, a husband and his death in the near future. I compared this book with John Gunther's "Death Be Not Proud." Gunther's account is watching and reacting to his teenage son's slow death over 60 years ago. The boy died as a result of a brain tumor. I encourage modern readers to read "The Last Lecture" but also read Pausch's book in conjunction with Gunther's and others of similar genre. In some sense, and I may be wrong, Pausch deals with his impending death as one would dispassionately observe other matters in life. Perhaps this is the role of an academic; I hope not because life is far more personal and complicated than reporting of facts or observations. I am a retired pastor who has worked with many people, including church members, on meeting the arrival of death. There is a stark humanity that levels all else in the closing days of one's life. I think Pausch struggles with his death with sensivity and a measure of cheer. But beneath his writing I sense a struggle to plumb a greater depth if time had permitted. Perhaps, given his early age but recognizing all he was leaving behind - wife of his dreams and children of joy - he could not reveal the deep emotion inside. I am sure it was there but he does remind us that intellect without the heart is a heartless death. In the midst of this fine man's death, I do not speak unkindly. In order to die well, as in life, one needs a mentor, a guide, a shepherd of the soul [religious or secular]. I heartily recommend readers buy and read the book, but also engage the purely personal and relentless journey ahead of all of us. Read also A.L. Vischer's "On Growing Old" and Helmut Thielicke's "Living with Death." In this book, Thielicke recognizes the struggle the modern world has in dealing with "a legal and medical definition of death . . [but] he explores the theological meaning of life in the setting of death." Combined, dear readers, you will profit from all of these books, including understanding Pausch in a way that most readers likely gloss over. Randy Pausch set his goals high and communicated that goal setting to his children and the world. Great man, great book!